Andrew Johns: "Matey, have I said too much?" The Great Gatsby is the latest film from Aussie director Baz Luhrmann. He could follow up with The Great Gai, an epic saga of the horseracing feud of the Waterhouses and owner John Singleton. One moral lesson from the tale is we all need to show more respect for words, or, in Rastafarian terminology, The Word, which is Holy. In my last post I asked whether bookmaker Tom Waterhouse, son of The Great Gai, was loose with his words when he said he backed his Mum’s horse, More Joyous. To back a horse usually means putting money on it. Bookmakers get to drive Maseratis by taking bets on racehorses not by making them. I surmised in my latest blog. Tom Waterhouse may have meant he offered generous odds about More Joyous’s main opponent All Too Hard which duly won the All Aged Stakes at Randwick racecourse on Saturday. As I wrote then, that is not the same as backing More Joyous. It is not only Tom Waterhouse who needs to .more precise with words. Owner of More Joyous John Singleton has said he took all his horses from trainer The Great Gai because three of his mates told him Tom Waterhouse had told them More Joyous could not win. Singleton implied The Great Gai had told her son as much. So far, only retired jockey Allan “Robbo” Robinson has put up his hand for contacting Singleton. But Robinson received his information, second, third or fourth hand, not from Tom Waterhouse himself. Rugby league, the main football code in Australia, is at the centre of the timeline of the “who-said what to whom”. Rugby league players, coaches and supporters have long been known as gamblers. In the late 1960s and early 1970s it was rumoured that half the illegal SP gambling on racehorses in Sydney was owned by a rugby league coach. The rumour mill said a former Premier (state leader) of New South Wales controlled the other half. 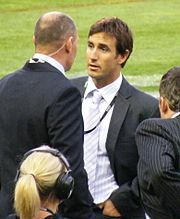 Former rugby league champion player Andrew “Joey” Johns commentates for the Channel 9 television network on which Tom Singleton heavily advertises his sports and racing bookmaking. On Thursday afternoon when Channel 9 was broadcasting a game, Johns had a quick conversation with Waterhouse at the match. On television a few days later, Johns said Waterhouse had told him More Joyous was “crook” an Australian expression meaning “ill”. Johns later said it was a poor choice of words and I believe him. Joey is a witty exponent of Australian vernacular but he is no latter day Shakespeare. This is what I believe is a fair recreation of the brief conversation between the two last Thursday. Johns: “G’dday, Tom. Whaddya like for Randwick on Saturday.” Joey’s a punter and he wants to back a winner. Bagman Waterhouse is yet to concede he bagged More Joyous on Thursday. But that does not matter. He could have developed a whirlwind romance with the prospects of his mother’s mare by Saturday. Whatever Waterhouse said to Johns, the ex-footballer repeated a version of it to someone in a crowded room at the next night’s football match. Jockey Robinson, who was in the room, rang Singo on Saturday morning to tell him about it. So no one is yet to substantiate Singleton’s version that he heard from one person, let alone three people, that Waterhouse had said More Joyous could not win. Waterhouse spoke in his paid ad on television after the football on Friday night. He said he thought the long odds-on favourite It’s A Dundeel was not a good thing. He was proven right as it was beaten the next day. He said he thought All Too Hard was a good risk. He was proven wrong. He was ambivalent on More Joyous. He said it was a good chance but he thought the third favourite Epaulette might win. Joey Johns is lamenting his wrong use of words and I am waiting Waterhouse’s interpretation of backing More Joyous. Trainer The Great Gai has said nothing publicly on the matter. Perhaps the Matriarch is the wisest of all. And I get to play one of the greatest Australian songs of all time. I could barely be more joyous.